Join EarthCam on Saturday, March 17th as they webcast exclusive views of the country's oldest and biggest St. Patrick's Day Parade in New York. Can't make it to the city? Don't worry! EarthCam is the world's virtual ticket to the parade. Join EarthCam on Saturday, March 17th as they “go green” and webcast exclusive views of the country's oldest and biggest St. Patrick's Day Parade in New York. The webcam, located at 48th Street and famous 5th Avenue, is perched high above the city streets and will deliver exclusive views of the parade festivities. The parade begins at 11:00am ET. Can't make it to the city? Don't worry! EarthCam is the world's virtual ticket to the parade, inviting visitors to experience the sights and sounds of the annual event. This webcam has the perfect vantage point to watch as the bands, floats and marchers make their way down New York's “path of prestige” on their way to St. Patrick's Cathedral. The New York City St. Patrick's Day Parade is one of the city’s greatest traditions, with the first march taking place in 1762. Millions of spectators flock to the city each year to stand on the sidelines and enjoy this true Irish celebration. EarthCam also offers an interactive St. Patrick's Day iPhone app. This interesting and fun app lets users enjoy live views of the parade on-the-go. 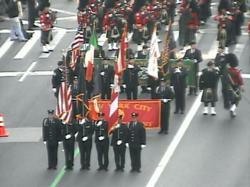 Check local New York time and weather and watch as the parade-goers gather on the sidelines. Users can step into a “photo booth” and share pictures of all the excitement with family and friends via email, Facebook or Twitter. Send some good luck charms, such as a pot of gold and horseshoe, their way too! The app also includes a special sound board of everything you would hear during the festivities, including the sounds of the Leprechaun and the popular “Kiss Me, I'm Irish” chant. 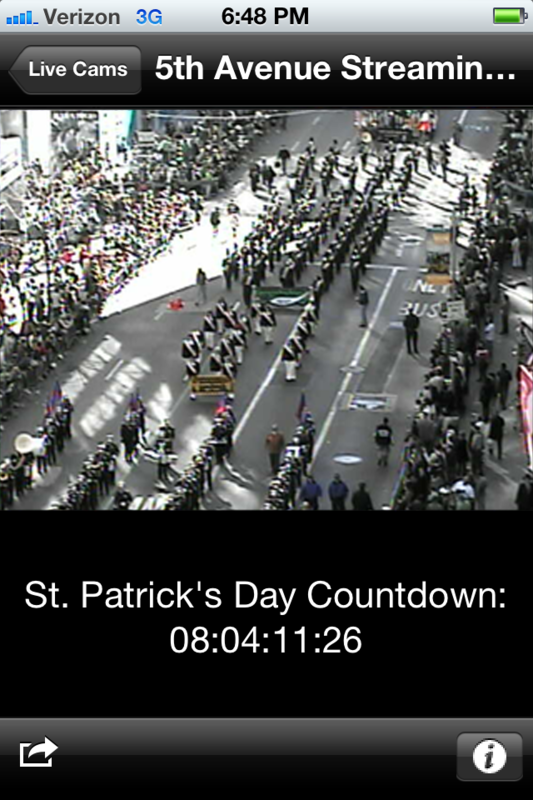 EarthCam's exclusive St. Patrick's Day iPhone app delivers live view of the parade on-the-go! 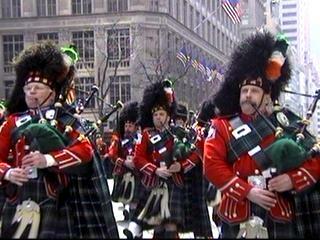 Bagpipers have become a fixture in the annual parade.